The Political Grunts and Groans of Claude Faraldo’s 1973 Film, “Themroc “ – LILY & GENEROSO 4EVER! Themroc (Michel Piccoli) lives with his widowed mother, his miserable wife, and his sister who saunters around the flat in various states of undress. Themroc also exists on the lowest rung of the proletariat ladder, a member of the “exterior maintenance crew” whose charge is to paint the outside of a fence while (you guessed it) the “interior maintenance crew” paints the inside of the same fence. Rarely has the stifling monotony of the working man been so aptly recognized. Though he is not happy, Themroc goes about his tedious job until one day when he witnesses his boss nuzzling the secretary of the company and is summarily dismissed. Themroc’s response to his sacking is a trip back home where he will begin his withdrawal from society but not in a “Neil Simon/Prisoner of Second Avenue” neurotic New Yorker kind of way. No, our Themroc sledgehammers a hole in his wall out into the street where he lobs the conveniences of modern society out for all to see while he turns his sexual frustrations away from his wife and towards his own sister (Beatrice Romand from Rohmer’s infinitely tamer masterpiece, “Claire Knee”). Added into the mix are the acting talents of Miou Miou and the late Patrick Dewaere, who would star two years later in Bertrand Blier’s breakthrough comedic classic of stunted sexuality, “Going Places.” With that, I must write that “Themroc” now seems like a harbinger for what would happen in European cinema over this decade. As exciting as the Italian Neo-Realist Movement, The French and British New Waves were to audiences in the 1950s and 1960s, there appears to have been a collection of young filmmakers who were poised to pull film into visceral and nasty place that would seem a natural response to the May 1968 riots. The aforementioned Marco Ferreri and Betrand Blier, Alan Clarke, and the last films of Pier Paolo Pasolini would set standards of honesty and raw depravity that few filmmakers around the world would be able to match. 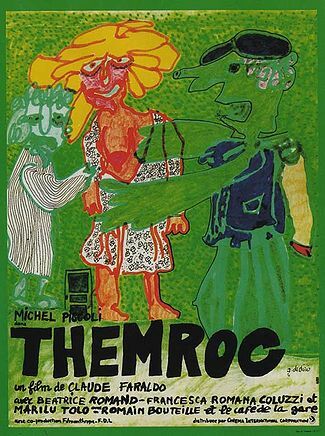 Though it received mixed critical and box office reception upon its release in 1973, I feel that “Themroc” would have fit right in with the recent films from European filmmakers like Bruno Dumont, Catherine Breilliat, and Gaspar Noe who would emerge the malaise of the 1980s with the same-minded style of Claude Faraldo and Jean Pierre Mocky, whose primary purpose was to pull the politeness out of what was a tired medium for their generation.